Taiwantrade.com is the leading business-to-business sourcing platform built to connect you with excellent suppliers from Taiwan. The website is operated by TAITRA, the foremost non-profit trade promotion organization in Taiwan. More than 90 percent of Taiwan's registered exporters can be found through Taiwantrade.com. Each supplier member on the website is verified using government and third-party databases to ensure the reliability of their legal existence. Information about their credentials such as business credit, product certification, scale of operation and manufacturing capacity are also made available for you to browse through. Home to over 70,000 excellent Taiwanese suppliers and 660,000 product catalogs, Taiwantrade.com reaches out users in over 200 countries. The website is currently available in 13 world languages presenting products from Taiwanese suppliers that are in high global demand, including machinery, automotive and motor parts, ICT devices, food and beverages, as well as hardware and hand tools. The services of Taiwantrade.com are designed to help you save time and resources. For example, the sample order service enables you to make orders directly to an excellent lineup of suppliers and have your shipment promptly delivered to your doorstep. For a more tailored sourcing experience, you can apply to Meet Suppliers Online and engage in one-on-one pre-arranged business meetings with potential suppliers via video calling services from the comfort of your own workplace. You can also make specific product requests to receive quick lists of recommended suppliers. 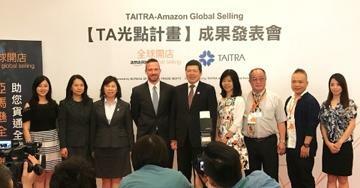 Together with over 60 TAITRA worldwide offices, Taiwantrade.com is committed to giving you round-the-clock support so you can connect with excellent Taiwanese suppliers anytime, anywhere.